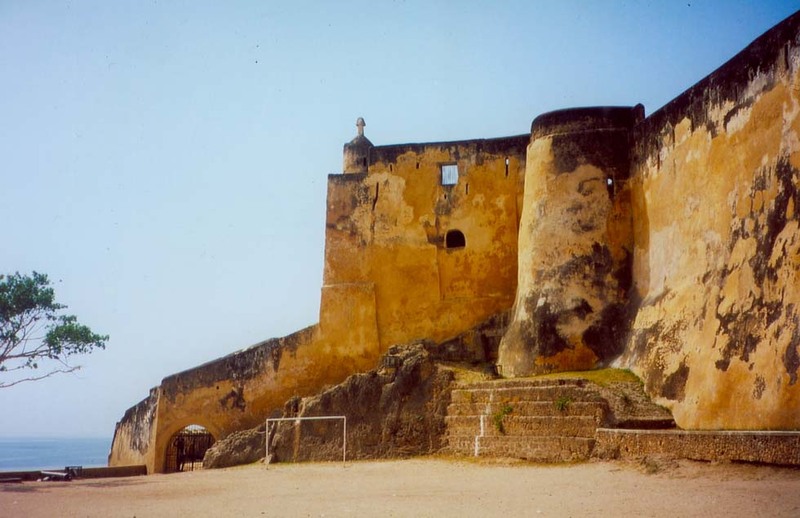 When Germany established its colony Deutsch Ost-Afrika, the all-British Cape-to-Cairo route was blockaded. Germany had its Tanganjika-Express and England its Uganda Mail to the chain of lakes. The connection with the British occupied Sudan remained a dream. Colors: cars varnished teak. 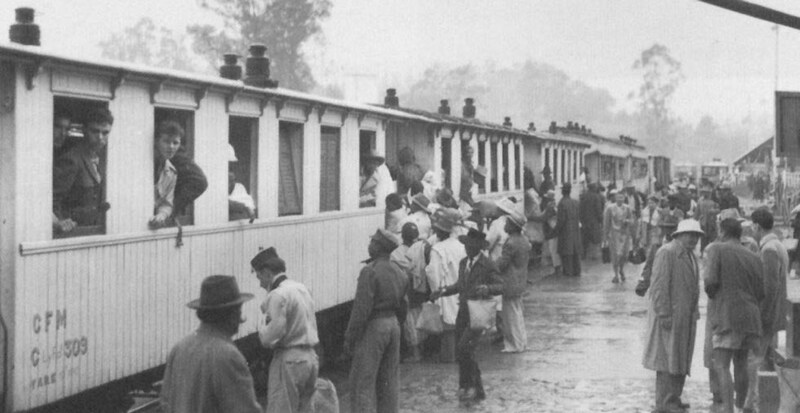 Later Tanganyika Railways, cars maroon/cream, then East African Railways, then Tanzania Railways. The mail Dar es Salaam - Kigoma with a branch to Mwanza continued service. At Kigoma there is a shipping connection on Lake Tanganyika to Mpulungu, but obviously no longer to Burundi or Congo. At Mwanza on Lake Victoria ships are departing for Kampala in Uganda. 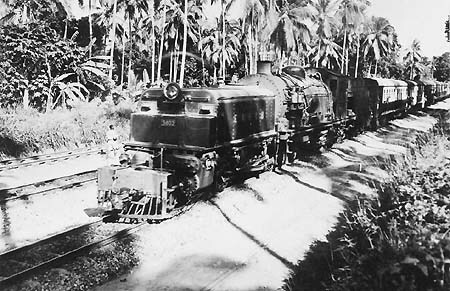 Tanganyika Railways: 4-8-0 (G/NZ), 2-8-2 (MK), 4-8-2 (RV), from 1930 Garratt 4-8-2+2-8-4 (GA), 1948 ex-Burma 4-8-2+2-8-4 (GB), 1948 ex-Malaya ex-USA/TC 2-8-2 (MR)? Colors: maroon, Garratts also black. 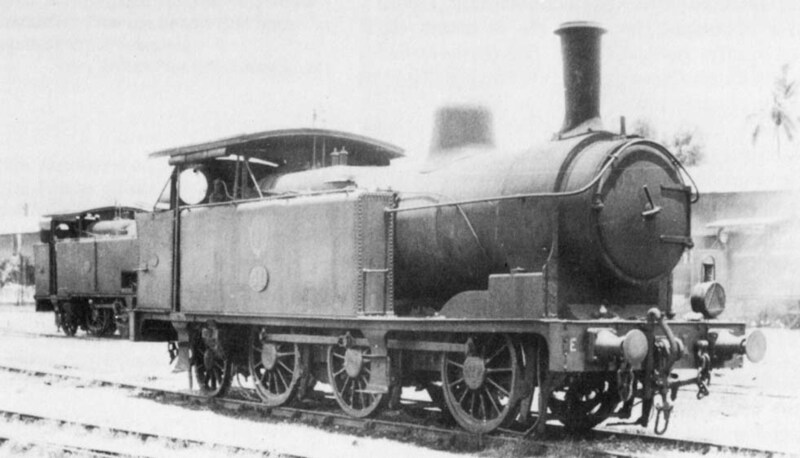 East African Railways: heritage, from 1955 2-8-4, Garratts 4-8-2+2-8-4 (e.g. ex -KUR EC2 and class 60). 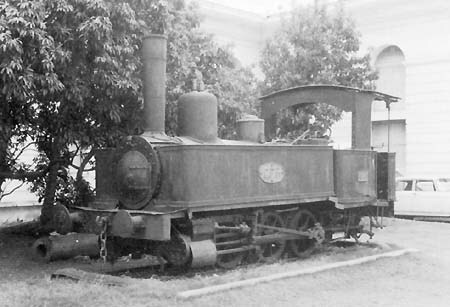 Tanzania Railways: heritage, 2-8-2 (from India, YG), diesel English Electric, MLW. Colors: cars maroon/cream, later Kenya Railways, green/cream. Aluminum cars initially had been silver. 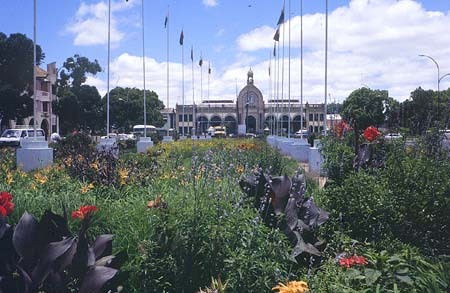 At Nairobi there had been the traditional connection with the Uganda Mail, later interrupted, in 1994 re-introduced Nairobi - Kampala, then allegedly Mombasa - Kampala, later the Uganda section disappeared, but the Port Florence Express Nairobi - Kisumu continued service. Cook listed e.g. in 2008 a “Deluxe” Mombasa – Nairobi, a train Nairobi – Kisumu, but services in Uganda “currently suspended”. The “Jambo Kenya Deluxe” Mombasa – Nairobi consisted e.g. 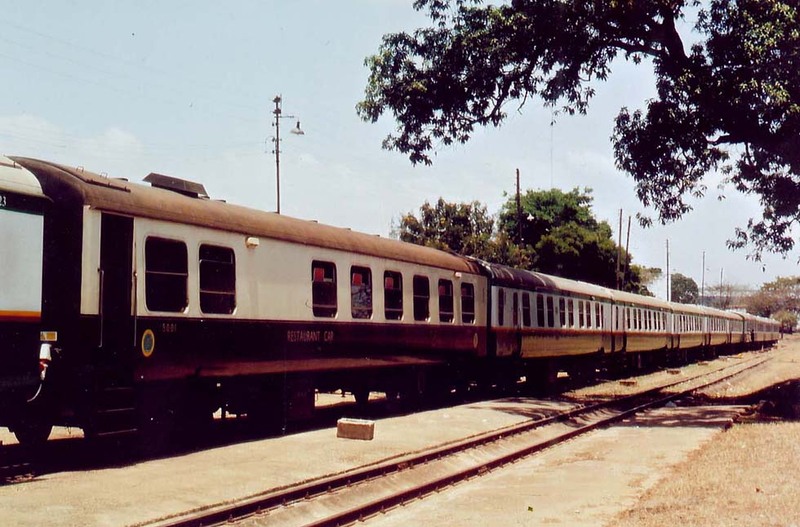 in March 2009 of 4 coaches, 5 sleeping-cars, 1 restaurant car, 5 sleeping-cars and a van, colors dark-olive green/ cream, restaurant car brown/ cream, the cars being built in Sweden in the late 70s..
Uganda Railway, KUR: 2-6-0 (N, B), 4-8-0 (EB), 2-8-2 (EA), from 1927 Garratt 4-8-2+2-8-4 (EC1, 1951 to Yunnan), from 1940 4-8-4+4-8-4 (EC3). 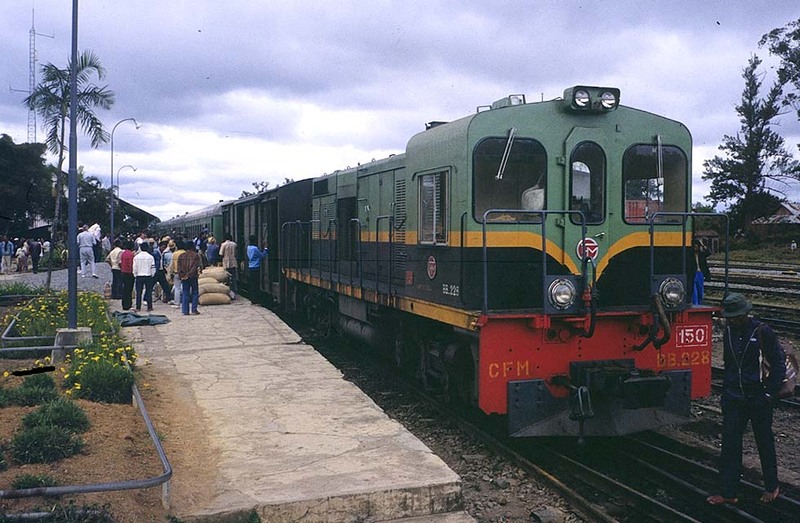 East African Railways: heritage, various 4-8-2+2-8-4 (GD, 1952 ex-Burma; from 1954 class 60; from 1955 the heavier class 59), from 1960 diesel English Electric, then MLW. The biggest 4-8-4+4-8-4 Garratt, proposed by chief engineer Bulman, was not built. Colors: KUR graphited, EAR maroon/black, diesels green, Kenya Railways blue. A curiosity was a small 3ft-gauge train on Zanzibar island. More important was Mauritius. 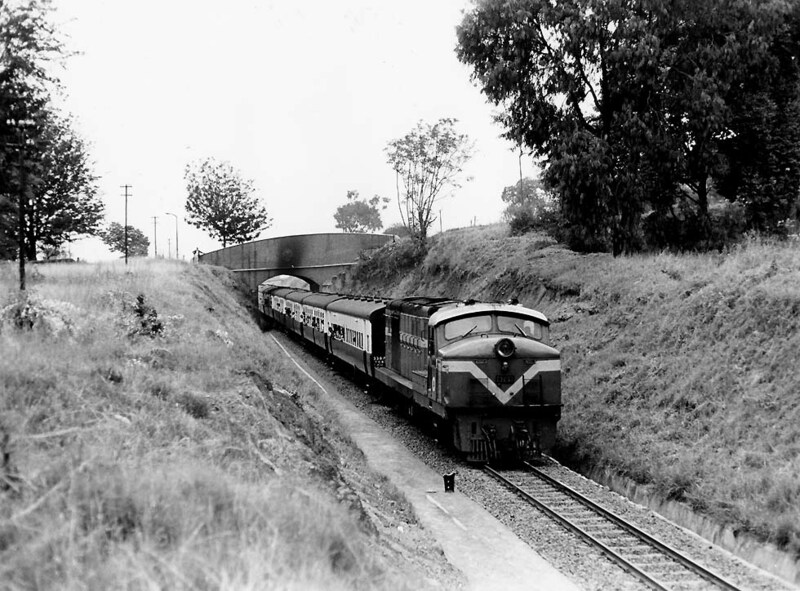 In 1862, after the island had become an intermediate stop of the British Australian Mail, a standard gauge railway was built there. British steamers served also the French island Reunion, where a meter gauge line was opened. These island railways disappeared. 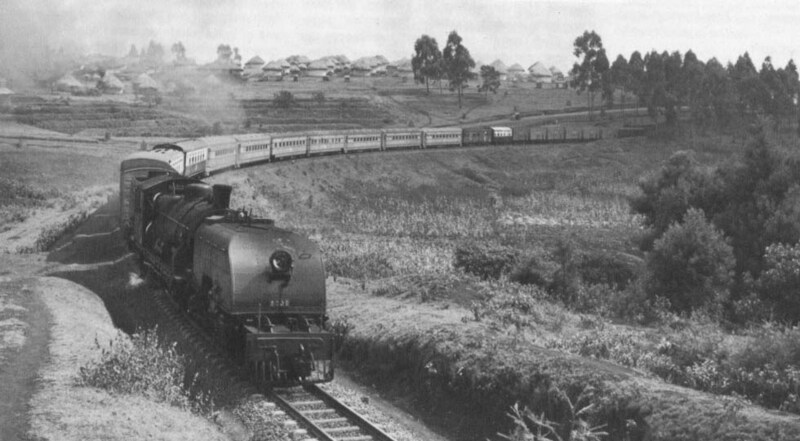 On Madagascar island the French steamers connected with a meter gauge railway Tamatave - Tananarive (Antananarivo), which had been constructed in sections between 1899 and 1909. Passengers could take the white wooden steam-hauled trains and temporarily a 1st class "Micheline" railcar. Dark/light-green mixed trains with coaches, some freight wagons and an old Alsthom diesel continued service for some time. 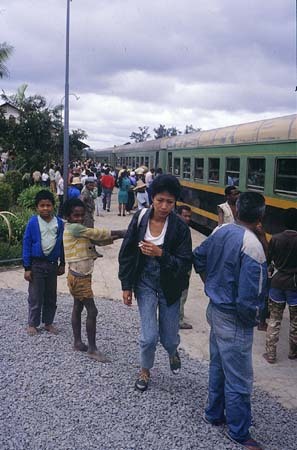 In 2007 however, a TV report showed a local Fianarantsoa – Manakara as the last remaining train of Madagascar. It would run as long as the only diesel engine is working.